The teachers have passed the latest contract. After tomorrow I will put the Duluth Schools out of my mind. Next Thursday I will be the lone Board member voting against the teacher’s contract as the meeting will be held on a day that Art Johnston can’t attend. He’s not happy and I’m trying hard not to be galled. I will be in St. Paul tomorrow where I can perform a little mischief – all in the name of being transparent mind you – but I’ll spare you the details even while whetting your apatite. I know. That’s not transparent at all. I was going to catch up on a lot of news stories in the blog from the Trib going back about a week but my computer won’t let me open the DNT website. I can’t even remember all the stories I have in mind. DEDA letting us carve up the Central site prior to our selling it at a discount. The roof at Lincoln that has not fully born up under the snow. There were a couple more of even more interest to me but the curse of growing old is a short term memory……..whatever that is. Don’t hate me but I’ll be in Florida for four days sweating out 90 degree temps and trying to finish Bully Pulpit. I’ve got about a hundred pages left of 750. Then I’ll dive into a book about Lincoln. I could use some lofty history now to cope with my petty injuries. Its because I’m both exhausted and feeling a need to bite my tongue. Sorry dear readers. My heart is good though! The School Board has been lobbied by former member Tony Stauber to rethink vocational education which has taken a hit in the Duluth Schools. There seem to be a lot of educators rethinking the role of votech schooling in the age of student bankruptcies over college loan repayments. But this reply to Tony from Art Johnston hints at a different kind of financing. Hi Tony and always great to hear from you! As you know, the former school board and Superintendent adopted the $293 (now $315) million Red Plan in 2007. It was originally planned to have ISD 709 keep and use the Secondary Technical Campus. In 2009, the former board and Superintendent modified the Red Plan, without public discussion, to close the STC and move many of those programs to Denfeld and East High School. So the STC, along with CHS, closed in 2011. We still do have excellent technical programs in automotive technology, construction technology, food preparation, nursing, and horticultural programs. Many of these programs are receiving grants form various industries. Can we do better in our technical programs? I’m sure we can. But I don’t believe that promoting technical education versus academic education is a zero-sum-game. We must to better all on segments of what we teach. A bit of history: we are still paying the debt for the $6.6 million STC that was built in 1996. We still have about $1 million in payments to go before that debt is paid off. And we still have no buyers for either that STC,the Central High School buildings, or the site. It is interesting to note that the STC was also constructed without a referendum in Duluth. There have been three schools projects in Minnesota done without a referendum: the STC (now closed); a school in St. Paul (now closed), and the Red Plan. According to MDE, those are the only major schools projects in Minnesota constructed by bypassing the referendum process. Hopefully, we have learned that listening to the public may have been a way to prevented these three less than optimal plans. And listening to the public may have been a way to promote more jobs oriented HS programs as you are suggesting. Other than vote against the contract next week and speak against it there is little I can do short of throwing an unproductive hissy fit. I don’t believe our teachers are overpaid. Neither to I believe that they are underpaid. What I know is that keeping this contract will make it almost impossible to lower class sizes in the time I serve on the School Board. That was my reason for running for the Board so in some ways a hissy fit seems justified. I will do everything I can to lower class sizes. One possibility would be to renegotiate our bonds. Note that Gary Glass and later Art Johnston suggested this but were told by the Finance Director that it wouldn’t be possible to lower our payments. I don’t know that I believe the Finance Director but if he’s right its one more reason to vote against the contract. I have my eyes on a couple of programs that, should we shut them down, could allow us to direct a half a dozen teachers into the classroom. Some of these programs are pets but as we begin to face laying off the measley 14 or so teachers who will be paid for by last year’s levy it may not prove to be that difficult a decision. What does this contract mean? Our classes will remain the most crowded in Minnesota. We will not resume a zero or seventh hour which will in turn limit our course offerings. Among the limitations will be the continued sparse music opportunities which are a shadow of what the district once offered and one of the opportunities that kept iffy kids in school. I could go on and write about some other grievous problems facing our district as a result of laying off teachers. I know this kind of talk flies in the face of what I consider happy talk by our administration. Call me Winston Churchill and call our Administration Neville Chamberlain delivering “Peace in our Time” upon his return from Adolph’s Germany. I have been whining about my health for the past couple weeks. That’s over with. I’m writing this with a great deal of equanimity. I’ve had a number of folks, including my wife, remind me of what I already knew. I can’t fix the Duluth School District by myself and its clear that I am part of a minority on the Board that doesn’t buy into happy talk. After getting a good health check up and thinking about my modest powers to influence the future I’m no longer feeling panic and waking up after mere hours of sleep. I’ll be much healthier than our schools and I’ll just have to live with that. I serve with folks who care about our schools, I can’t fault them for that, but we are in for a long slog. WW II lasted four years. So will the teacher’s contract. Our war won’t end when the contract runs out. It will just be heating up. Until the melt hit us I had no enthusiasm or inspiration to sculpt through the coldest sustained below zero temps in Duluth history. Then my buddy Frank suggested the Wicked Witch of the West. 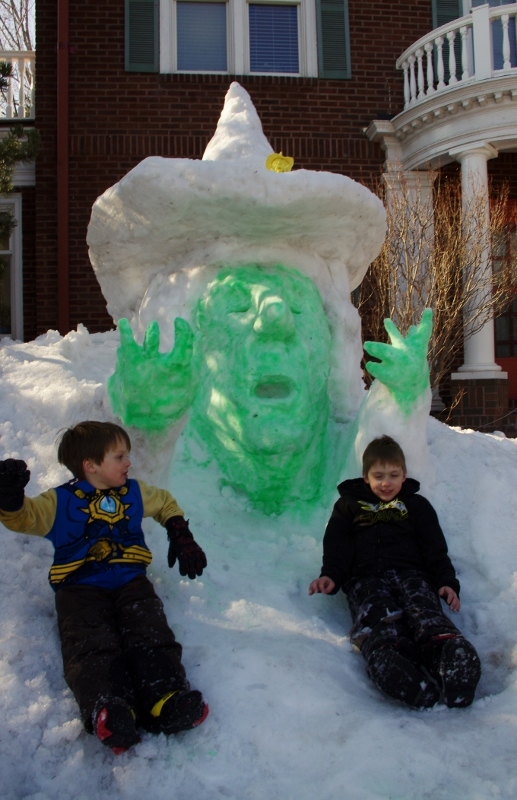 I had the snow piled up raring to go and I called my two grandsons to help paint her green. More snow sculptures of mine here. My buddy sent me a couple proof reading corrections for the last post in the second paragraph. One pointed out I meant stanch when I used staunch. They can be pronounced the same way with the “aw” sound but I’ll admit I never recognized that they had different spellings. They both suggest something akin to the strength of reinforcement. For instance: The GOP must stanch the loss of elderly adherents by by being less staunch in its nativist inclinations. The first nativist party in the US the “No Nothings” was anti immigrant. Too many Catholic Irish were fleeing the potato famine bringing their terrible religion with them. Subsequent bouts of nativism hit American shores when too many Chinese showed up during the California gold rush. Then horror of horrors strangely speaking Eastern Europeans started answering the Corporate advertisements from American firms looking for cheap labor. That was a straw that led to a law I couldn’t recall having ever heard about. At the turn of the Ninteenth Century Congress passed a law taking American citizenship away from women who married legal immigrants. For thirty years that law deprived tens of thousands of women of their birthright and did so retroactively including one woman from Two Harbors. Abe Lincoln was a pragmatist who was quite happy to solicit Irish and German votes and even No Nothing votes. Today’s GOP wouldn’t have much use for that RINO kind of thinking. Over the next couple decades they will find it harder to stanch the loss of elderly nativists and will be forced back to Lincoln’s pragmatism. Viva el Rinos. There is another tenant of the modern GOP that might have to undergo some revision, the wealth protection laws that turned estate taxes into “death taxes.” Apparently to discover just how it was that the once anticipated economic equality associated with democracy has been turne on its head one economist began reading antique novels from earlier centuries. inheritance and wealth. He quotes a character in a Victor Hugo novel who tells an ambitious young man to forget about work and to marry a rich woman. Hey my Mom could have told him that. She read lots of antique novels by the Bronte’s, Jane Austin Charles Dickens etc. We had talks about how families did their best to protect their wealth. I read about primogeniture in my own history books. That where only the oldest son inherited all the land and the younger brother’s took the hindmost. Anyone who has watched a lot of PBS’s Masterpiece theater over the years has seen the same like Downton Abbey. Marry a rich American woman. That was the call of several generations of failing noble English families and its been grist for hundreds of period piece dramas. Well-to-do Americans have jealously guarded their wealth by intermarrying their children in America for generations. Its been a fixation that has been shared by other rich folk throughout history. In more recent generations it has been aided by country club memberships and gated community living. Those knocking eagerly from the outside for a piece of the action have been regarded with suspicion. My Mother told me about the woman who married a cousin of hers who was regarded as a “grass widow.” I guess that meant she was hiding in the grass waiting to snare their precious son. The threat to disinherit never was broached but that is another very real threat that has made it into countless dramas. Well, the rich are getting richer and not only because they have built a social wall around themselves but a legal and legislative wall built with a political agenda to keep taxes like the estate tax low. What kind of folks would accrue this wealth and then fight back attempts to share it? That’s another NPR story. this. Is it any wonder that NPR and PBS are always on the GOP chopping block? Q. What can I do in four years? As I shoveled last night’s eight inches of snow from my front walk at noon my coat was open to the wind because I was a little warm. That meant the electric cord poking out from my shirt to the heart monitor in my breast pocket was exposed to the traffic driving by. I hope the drifts on the curb were sufficiently high so as not to alarm the drivers passing by. I’m becoming resigned to more impoverishment and further cuts to school program. I will vote against the contracts even though they are not quite as hideous as I anticipated. We can implement them them over the next three years without cutting more teachers. At least that’s my guess. I have some ideas on how to stanch the bleeding but that will depend on the decisions of an entire School Board on which I constitute only one-seventh of the votes. I have been itching to write a book for the past twenty years since my last total catastrophe. I’ve been thinking about writing one about teaching for three decades. In more recent years I’ve thought about wriring about the Duluth School Board and more recently the Red Plan. Now I’d like to write about Minnesota’s history of public education as its affected Duluth. Last night I looked through the book by the author of Minnesota’s first in the nation Charter School Legislation. I’m going to return it soon to the fellow who sent it to me because I’ve just ordered it on Amazon. I can add to its chronology which ends in about 1993 because shortly after that I voted to bring a charter school to Duluth. I wrote a series of extensive emails on my experiences in Duluth to a Missouri educator who was attempting to get a charter law passed that state at the time. That piqued my interest in another tome I’d gotten a year ago to write about one of the biggest political scandals in Minnesota history. For the Good of the Order a book about the first ever DFL Senate majority leader Nick Coleman has a ton of information on the Minnesota Miracle which is also part of Minnesota Ed history. I read a couple chapters of it and recalled a lot of familiar names from my college days when I was watching the state legislature pass the Miracle. Today I looked up Minnesota Strike history and found that that also began in my college years with the first illegal strike in 1970 by Minneapolis teachers. In two years strikes were legalized for teachers state wide. With the Miracle and the Right to strike the state legislature not school boards became the chief bargaining agent for local school districts. Its a fascinating history and if I am ever to get Duluth straightened out I must make sure this whole city and our teachers understand the sticky web we all rest on. Here’s a brief chronology of teacher unionization in US history. I recall a lot of it since 1965 when I sat in Mr. Just’s Eighth grade geography class reading the news he had us study each day. I learned recently that the staff of the Minnesota Department of Education, down in Roseville, watched our March School Board meeting on the tube. Imagine that! Evidently they were taken aback by the comments of some of our members one of whom called the MDE hypocrites for expecting us to teach the full curriculum at Laura MacArthur School. I feel like that little girl in Poltergeist. Check that! The poltergeists were on the other side of the tube…..that’s my side! ..if you can’t tolerate mistakes. I’ve just learned that I was off the mark in this unhappy post this morning. The News Tribune’s headline was right to say we had a 2% pay raise for teachers this year. Thank heavens. I’ll be a little more likely to vote for for the contract now despite the budgetary ignorance I’ve been forced to endure since joining the Board. The novel twist is this. Apparently the District will pay our teachers a full three percent raise on just the three new days our teachers will add to their calendar. They will not get this three percent on the other days but only on the three additional days placed in the contract. This is so unexpected I incorrectly deduced that the extra 1 percent was a raise of a full year’s salary. This will still leave us with a $9.6 million deficit to deal with in a few years but it doesn’t sound like it will be much worse, certainly not the additional two million cost I predicted in the Happy Happy Happy post. Hallelujah! And to those who were stung by my reporting of misinformation, I apologize. See, That wasn’t so hard to do! 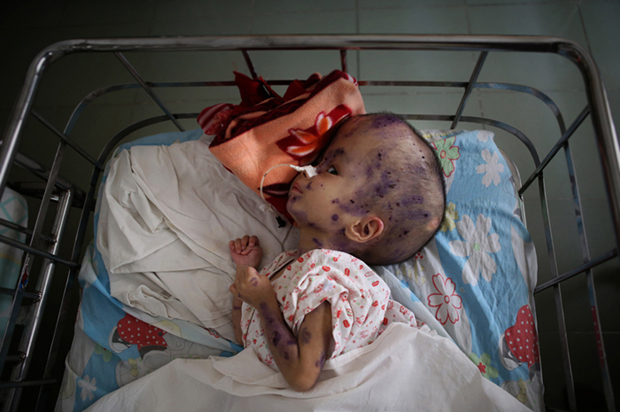 Forty years ago we refused to agree that Agent Orange was poisoning our troops or the Vietnamese. Today some of us are back pedaling to deny we ever tortured anyone. I’ve been getting many emails about the proposed anti-bullying law at the State Legislature. I don’t know its contents. If it passes I will have to get familiar with them. One thing I believe. It is near impossible to legislate what people think and only practical to legislate how they act. Faris and Felmlee come out with one clear proposal for schools: Bullying-prevention programs should try to de-emphasize hierarchy. The more that students feel there are multiple routes to social success, the choir as well as sports, chess champion as well as class president, the better. That sounds right to me, but also hard for adults to construct. Teenagers have to have their own ways of taking each other’s measure separate from adult wishes and meddling. That’s part of growing up. The trick is for them to lead each other to social rewards that come from building other people up rather than tearing them down. This study is an important reminder that all kinds of kids benefit from making that shift, from all points in the high school universe. The “it gets better” series often makes a similar point, to wit: once you escape the suffocation of high school and get into the larger world, often college, the social hen pecking of high school stops being such an all consuming tyranny. Maybe we should make high schools like college. Send kids off in more directions in their schools instead of create a pyramiding activities that are supported institutionally on the basis of their popularity. Sadly, the Duluth Public Schools are so strapped that creating alternative venues outside of class will require outside help to fund and organize. Heck, Our once storied music program which provided so many kids such an alternative have been nibbled back like a rose garden after goats get past the gate. Who says theologians don’t have a sense of humor? I just got back from my treadmill test all hooked up with leads and wires to monitor my heart for the next 48 hours and poured myself a fully loaded cup of coffee. Claudia told me about getting the grandkids off to school this morning after I’d left for the clinic and handed over her “Presbyterian Handbook” which had a short chapter identical to this post’s heading. If all else fails they recommend asking your executioners for dry wood to make your exit from the world less onerous than it would be if they used wet, green and smoking wood. I did myself proud managing to keep up with ever speeded up and inclinated treadmill for fourteen minutes until my heart was beating fast enough for ultrasound. I was told that marathoners can take up to 22 minutes to reach the fevered pitch necessary to take that ultrasound. The typical geriatric only lasts 7 or 8 minutes. These tests and the knowledge that its too late to stop the bargaining process with a reset button will do wonders for my tranquility. I have to forgive myself a bit. Having some useful affect on a process that was already four months old by the time I was seated on the Board was a little like hopping on to a rapidly spinning merry-go-round from a stationary jump. Knowing that I have little control over a bleak future may end up being less stressful than the illusion of having control and furiously trying to exercise the illusion. At the end of the ride the lady was inside, and the smile was on the crocodile! Board member Harry Welty said he is worried about the district’s long-term financial picture. I also told the reporter one additional thing that was not included in my quote and it is one small part of the apology I feel I am owed. At no point has our Administration felt compelled to divulge the fiscal forecast for the Duluth School District despite my repeated calls for it. Two month’s ago they inadvertently showed us that with a much less costly teacher’s contract we were projected to be $9.6 million in debt by about 2017. I say about because that was a figure that was flashed up on a “smart board” for about ten seconds while the Finance Dept demonstrated their inability to run a power point presentation very well let alone display a spread sheet with numbers deep in the red. I’ll reiterate, our projected deficit has never made the light of day since that mistaken revelation despite my repeated requests. I wonder if I’ll get to see it before the our school board gets to vote on this upcoming fiscal calamity? Few school boards in their right mind ever settle a four-year contract. Fewer yet would do it without seeing a financial forecast. God forgive the District that would do it with the kind of classroom overcrowding that the Duluth School District endures. Now I understand what the Red Plan really meant. Our Administration seems to thrive when it brushes aside reality for a good fresh breath of positivity. The $9.6 million deficit in the next three or four years will end up being closer to a $12 or $13 million deficit. That’s because this year our teachers will get a 3% pay increase instead of a 2% pay increase which was the assumption in that now veiled spread sheet which died and went to heaven. Oh, but you won’t read that 3% figure in the story. It says we are offering a 2% pay increase this year. Then it adds the camouflage. We are also paying out 1% because our school day for the secondary schools had been whittled down by an arbitrator a few years ago to 1,020 minutes less than the state of Minnesota expects us to teach our secondary students. To add some of that time back to the teaching year we are giving the teachers 1% over and above the 2% or (if I’ve added my fingers correctly) 3%. By the end of the contract in three years that will be close to another $2 million to the projected deficit. So, you may wonder, how much will the projected deficit be offset by last year’s passage of a $1.8 million excess levy? Most of us voted for it to hire more teachers and reduce class size. Ah, but we will be spending $400,000 of the levy annually on other pressing problems. Right now we are devoting $1.4 million of it each year to class size reduction. By the time our new teacher’s contract leaves us with a $12 million deficit our levy will have contributed $5.4 million to reduce class size. That means we will have hired about 14 teachers with the levy money while we are forced to cut about 30 teachers due to the deficit which will balloon because of our amicably negotiated teacher’s contract. No new teachers. No seven-period day. Music offerings continue to shrink. More kids in each class. That’s just swell. Of course, I might be off a bit on the fiscal details. Did I mention that I’ve never been shown the details of the fiscal forecast? Then again, why should the Superintendent and the Director of Finance bother to show this stuff to me? I’m only a school board member. Let me be the first to put a letter in my personnel file for incompetence. It’s what the public expects from us and I wouldn’t want to disappoint them. Just a funny word to start a problematic post. Problematic because I wrote it yesterday and thought I’d posted it only to discover it disappeared; likely, because of my haste to get a dozen things done at the same moment. So I’ll start over. Right now I’m swimming like a salmon upstream to spawn with lots of Grizzly Bears in the water. For three days I have written, roughed out really, half a dozen long tomes to send fellow school board members and our administrators. I have the thinnest possible chance to stop the School District into leaping into a black hole and I’m almost beside myself trying to figure out how to stop an implosion minutes before the plunger falls. Today, if I’m up to it, I’ll do the next and tougher step of editing all the thoughts I’ve let tumble out on nine separate letters comprised of 19 pages of heartfelt logic, history, metaphor and any other kitchen sink I can think of to throw in. Some this I’ll eventually make public. One that will soon see the light of day is a plea I’m likely to give when we vote on the the teacher’s contract. I may soon compose another to send to the Duluth News Tribune. I don’t know when the guillotine is about to fall but I’ll be working like this till the executioner pulls the cord. But I have a life to life in the meantime and that’s what I recorded in brief yesterday before I pushed something other than the upload button on yesterday’s post. I read aloud to Claudia. I think she welcomes this despite a formidable reading list of her own for her Seminary classes. She has about twelve books to read in three months. She has cheated on her Book Club by letting me read aloud a couple of books for that group even though listening to me is far slower than reading the books for herself. I found a book I’d heard about on NPR recently when we stopped by to pick up more books at Barnes and Noble. That shopping expedition earned our grandson’s school some magic brownie points and we almost tipped the scales with a one hundred dollar book purchase. One of the impulse buys was a National Book Award winner, Sherman Alexie’s: The Absolutely True Diary of a Part-Tme Indian . I just read that “young adult book to Claudia in three days. It helped that it snowed straight through one of those days. Claudia knitted while I read and we paused to watch the cars spin uselessly below our sun room window. I’d like to read it to the kids at Lifehouse where many of the kids our school district fails wash up. I’m just a piece of the furniture there to the kids who probably only see a gray bearded old fart hanging around awkwardly not sure how to start a conversation. Fortunately I’ve played Scrabble and Table Tennis with them and brought my sketch book to ease into conversations. I’m set up to be a tutor and I guess I passed my criminal background check. I’ve got a tutorial set up to learn the Plato computer learning system for kids working on their GEDs. I’ve got the Blue Book of Minnesota Government that Sen. Roger Reinert sent me and today, a couple days after I received it another interesting book written by one of the Authors of the Charter School legislation that brought Edison and a hundred other Charter Schools into existence just before I got elected to the School Board in 1995. Like Rudy Perpich whose brainchild Charters are Ember Reichgott Junge is a DFLer. I’m guessing that I’ll find a dull book fascinating the way wonks often do. I’ve also got the School District’s 70 page budget for last year in front of me. I got about 12 pages into it when I was seized with worry about our next four years worth of budgets, the projections of which the Business Office has withheld from the Board as we contemplate approval for salary increases we can’t afford for the next four years. Oh still my beating heart. By the way I’m not through with my medical evaluation. I go into St. Lukes for more testing tomorrow. No caffeine for me until I walk on the treadmill and get fitted for 48 hours heart monitoring……speaking of which there’s an uncomfortable sensation near their now…..probably from sitting at the computer keyboard too much lately. I also have a fascinating document from the past which says that the IRRRB (Iron Range Resources Rehabilitation Board) is unconstitutional. I found this when I inquired about the Triple RB’s giving Iron Range Schools money to build a new school. I have my fingers on lots of interesting history. Gotta Go. I’m meeting with a financial advisor to put our retirement finances in some kind of order in fifteen minutes. I was quite pleased with Loren Martell’s latest column in the Reader Weekly describing our March School Board meeting. I said not long ago that there was still about five minutes to lobby for the Teacher’s Pension at the legislature. The Union is finally getting on the stick and has sent some folks on a bus to St. Paul. Frank Wanner told me it was a coach not a school bus. Below is a brief update of the pension merger moving in a forward direction…it’s not too late to send Governor Mark Dayton a letter. Please share with the members in your building. We understand how important a secure and stable pension is to attract good teachers and encourage them to make teaching a long-term career. That’s why we’re successfully pushing legislation to merge Duluth teachers’ pensions into the statewide Teachers Retirement Association, with full state funding for the unfunded liabilities. HF1951/SF1803 passed the Legislative Commission on Pensions and Retirement earlier this month. The House has included, and it appears the Senate will include, the $14 million in annual state aid necessary so TRA members and their district won’t bear the consolidation cost. The Duluth Federation of Teachers engaged members early on this issue, making calls and writing letters to legislators urging their support and sending a busload to St. Paul to lobby lawmakers in person. The Duluth Teachers’ Retirement Fund Association faces a severe funding shortfall through no fault of the workers. If the Legislature doesn’t act now, the costs of resolving the issue will only increase going forward.